Tedeschi Trucks Band delivered a resonant night of music that dazzled the full house gathered at Thomas Wolfe Auditorium to see them Saturday night. 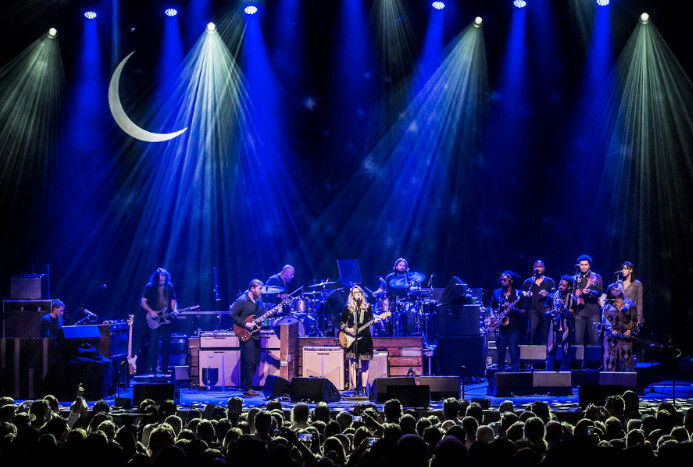 If the winter warm-up to a new year of touring was any indication of things to come, Tedeschi Trucks Band is going to have an outstanding 2018. First though, it’s worth noting just what the audience brought to night one of Derek Trucks and Susan Tedeschi’s two-night stand in Asheville. Saturday was the first warm day after weeks of a deep freeze that’s kept folks under wraps. A snow-shot Wednesday forced the cancelation of events, slowed commerce at city shops and shut school for the rest of the week. Saturday was also the anniversary of both President Trump’s inauguration and the Women’s March organized to oppose his policies. Thousands marched through the our liberal mountain metropolis earlier that afternoon to rally their cause. All that pent-up energy needed somewhere to go. The auditorium crowd found its outlet, as Amy Ray and Her Band soon discovered. 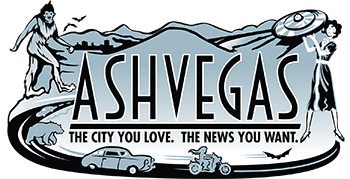 Asheville audiences have long showered the Indigo Girls with love, and impromptu cheers of support and joy peppered her set of old and new tunes. 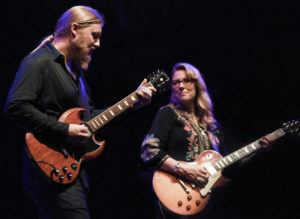 She brought Tedeschi out for a song that she recorded with Tedeschi and Trucks a few years ago called Duane Allman as part of a set that showcased her own muscular melodies and commanding voice. (The obvious homage also honors Trucks’ deep connections to Allman and The Allman Brothers Band.) The crowd roared. Ray is a first-rate lyricist whose been verging into rock ‘n’ roll country territory over the past few years, and she sounded great Saturday night. She told her listeners that she’ll be hanging around to record new music at Echo Mountain Studios this coming week. She also took time to introduce her band, which included hometown boy Matt Smith on pedal steel guitar. (Locals recognize Smith’s pedal steel from Asheville-based Amanda Anne Platt & The Honeycutters, of which he’s a member.) The crowd roared again. The 12-piece Tedeschi Trucks Band appeared on stage after a short break and immediately melted any lingering frost. Two pounding drummers, a raucous horn section and soulful back-up singers built a wall of sound decorated by Trucks’ dirty slide guitar and Tedeschi’s husky, transcendent vocals. Three tunes in, the crowd had already been pulled along the hopeful rise and heartfelt falls of their unique blend of soul, blues, rock and country. It’s both a seamless blend of genres and an approach that draws clear lines between them all. The Tedeschi Trucks tapestry illuminates and enlightens. Trucks’s dancing, screeching solos never go too far while leaving fans shaking their heads at his virtuosity. Tedeschi’s soaring vocals take listeners to church and back. It’s gritty and gospel, technical wizardry and mindful magic all wrapped up. On this night, though, there was a shadow of a disconnect between the two main players. Nobody can know the internal workings of a husband-and-wife musical relationship but the principals themselves. Still, a little lack of chemistry can occasionally peek out in such a sea of mastery. Nothing distracted from the overall heat generated on this winter night, and each member of the band had a chance to glow, too. Two highlights: vocalist Mike Mattison’s bluesman scratch and keyboardist Kofi Burbridge’s silky flute provided just-right breaks and bridges to connect the music along the way. There was also a deeper resonance to the night’s song choices, harkening back to the swirl of circumstance outside the theater’s doors. Whether they were bluesing it up with I Wish I Knew How It Would Feel to Be Free or flowing from Angel From Montgomery to Sugaree, there was a sense of unity in the room, a sense of overcoming. 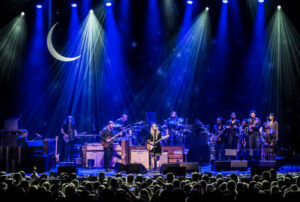 Tedeschi Trucks Band’s optimistic Keep on Growing, and their cover of Leonard Cohen’s lovely Bird on a Wire, stirred any soul ready to heed the call.